If you've ever dreamed of going on an African safari, you've heard of the "Big Five": the Cape buffalo, elephant, leopard, lion and rhinoceros. We asked five top guides for the animal that they would most like to spot in the wild. Here isElusive Big Five list. If you've ever dreamed of going on an African safari, you've heard of the "Big Five": the Cape buffalo, elephant, leopard, lion and rhinoceros. While these animals are now said to represent the large fauna that safari-goers would most like to see, the term actually has a more sinister origin. It was coined by big game hunters decades ago to refer to the difficulty in hunting these massive creatures on foot -- and the danger involved when they were cornered and shot at. "The animal I have never seen but still hope to one day is the African black-footed cat," says Russell Gammon, one of the top guides on the continent, who has been leading photographic safaris throughout southern and eastern Africa for more than 25 years. "It's the smallest wild cat in Africa -- about the size of an ordinary domestic cat," explains Russell, "and yet it manages to survive alongside a host of larger predators in the deserts of southern Africa. The San people call this creature 'anthill lion' for its ferocious courage. For me, its rarity is matched only by its elusive and secretive nature, making spotting it a once-in-a-lifetime event. I will be returning to the Kalahari in June to continue the hunt!" 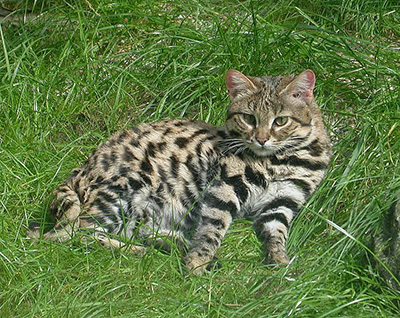 Your chances of seeing an African black-footed cat while on safari: The black-footed cat can be found in the Kalahari Desert and in South Africa's Karoo Desert and Highveld. It is estimated that there are fewer than 10,000 of them left in the wild, and the IUCN classifies them as vulnerable. Because they are nocturnal, solitary and very shy, black-footed cats are almost never seen by humans. Bushtracks guide Russell Gammon's family has lived in Zimbabwe since 1892. In addition to his encyclopedic knowledge of Africa's wildlife, Russell is an authority on the life of Scottish missionary and explorer David Livingstone. Russell has lectured extensively on Africa's past -- as well as on the challenges that now face the country in preserving its dwindling wilderness -- to audiences as far afield as Singapore, Hong Kong and the United States. Although wildlife photographer, sound recorder and Bushtracks guide Derek Solomon has seen an aardvark several times, he has never had the opportunity to photograph one. "Despite my occasional luck with it," states Derek, "I have not been able to show it to very many guests while on safari." 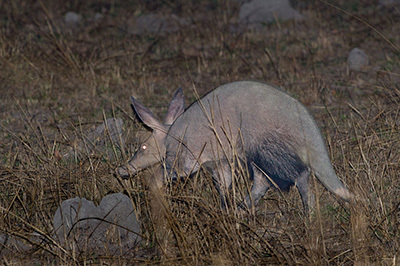 Your chances of seeing an aardvark while on safari: The aardvark is relatively abundant throughout sub-Saharan Africa, but because of its evasive, nocturnal behavior, it has rarely been spotted by even the most seasoned and experienced guides. Derek Solomon has been leading special-interest wildlife safaris in southern Africa for the past 25 years. He has researched underwater communication in hippos and now records wildlife sounds ranging from ants to elephants. His collection includes nearly 250 species of birds, 22 species of mammals, as well as many amphibians, reptiles, and insects. He sends most of this material to the Macaulay Library at Cornell University. Derek is currently writing a field guide to the wildlife of Zimbabwe and Zambia, as well as an iBook on the premier birding destinations in southern Africa. "The animal I have yet to see and am longing to is the scaly anteater or pangolin," says Anthony Dodds, a Natural Habitat Adventures guide who says he is happiest leading guests who aren't as interested in how many species they see as in what they see the animals doing. "This nocturnal creature is an armored version of an aardvark. Like an armadillo, it rolls up tight when it is threatened. "Sadly, though," says Anthony, "that makes them easy prey for humans who view them as a delicacy." Your chances of seeing a pangolin while on safari: There are three different species of African pangolin, native to 15 African countries. Because they are nocturnal, spotting one can be the ultimate prize, and many safari guides will retire without ever having seen one. 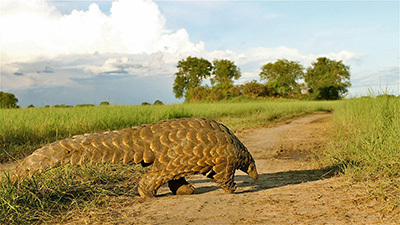 Pangolins are hunted for their meat, and growing demand in Asia is working against them. Still, the IUCN lists them as a species of least concern. Anthony's great grandfather took the family's first step on the African continent in Cape Town -- dressed in the uniform of a British officer -- posted to fight the Boer in the late 1800s. His grandfather Bazil was born in South Africa and sailed to Kenya in 1922. Anthony's lifelong passion for East Africa's wilderness began when he was born on the shores of Lake Victoria in 1962. In season, Anthony can be found guiding in many of east Africa's marvels, the Maasai Mara National Reserve, the Serengeti National Park, the forests of Uganda, or in remote northern Kenya. When not on safari, Anthony grows tilapia. He is committed to producing sustainable sources of affordable protein and provides training to budding fish farmers in neighboring communities. For GeoEx guide Brad Hanson, a safari is about the big picture; it's about "the scenery, sounds, smells, campfires, anticipation, adrenaline, big stuff, small stuff, birds, isolation, moon, sun and stars," he says. But when pressed to name the animal he'd most like to see, he emphatically states, "the leopard, although my leopard is one with a twist. "In my mind," says Brad, "the leopard is the perfect animal, and I can't think of a single thing I'd change in its magnificent design. The kind of leopard I long to see, though, is a panther. 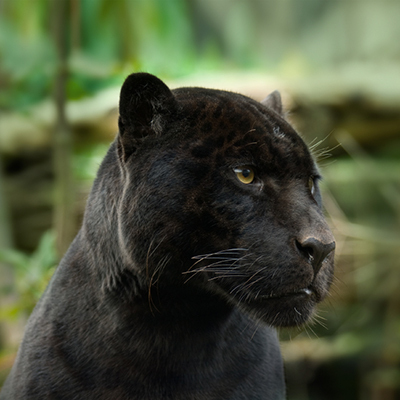 "Melanism in leopards is inherited as a recessive gene," explains Brad, "creating an animal with excess melanin, which in turn gives the animal the black coat that people commonly associate with panthers. Interestingly, this phenomenon also occurs in jaguars and cougars. People often think a panther is a specific species of cat, when in truth it is essentially a black version of any of these three cats." Brad's home in Arusha, Tanzania, overlooks beautiful Mount Meru. "I often stare out my window, wondering how many panthers are there and what they are doing," muses Brad. "I know from old records that the recessive gene exists on the mountain, and I imagine them looking over Arusha from the vantage point of a tree in the forests of Arusha National Park on the foothills of Mount Meru." Your chances of seeing a panther while on safari: While your chances of seeing a leopard are generally pretty good, the odds of seeing a black panther are almost nil. For your best opportunity, visit the forested slopes of Mount Kenya and Aberdare National Park. Brad Hansen was born in 1981 in South Africa, where he developed a passion for the continent's wildest parts. He studied guiding through the Field Guides Association of Southern Africa, taking a special interest in walking and tracking. He now leads tours through Botswana, Ethiopia, Kenya, Malawi, Namibia, South Africa, Tanzania, Zambia and Zimbabwe. In addition to guiding, Brad has worked alongside National Geographic filmmaker and adventurer Kingsley Holgate. He was involved with the Africa Outside Edge Expedition, which was the world's first circumnavigation of Africa along the coast by means of a Land Rover, covering some 35,000 miles. He was also part of an expedition that followed and documented the Great Rift Valley from start to finish. "Wild dogs used to be common and widespread in the Maasai Mara National Reserve," says Natural Habitat Adventures guide Joe Charleson, when pondering the most elusive African animal that he likes to see. "When my family emigrated to Kenya in the mid 1980s, I remember seeing packs of wild dogs on some of our first family safaris into the reserve. Soon afterwards, however, persecution from a growing population of local herdsmen -- as well as rabies and canine distemper transmitted from domestic and feral dogs -- took its toll, and wild dogs became a distant memory in the minds of those living and working in the Mara." A similar story was being recorded over much of Kenya; and by the end of that decade, wild dogs were regionally extinct in many areas. Since then, however, there have been some success stories. Laikipia, the plateau between Mount Kenya and the Aberdare Range, now has more than 300 wild dogs in well-established, stable packs, thanks to conservation initiatives. Unfortunately, the same sort of actions are lacking in the Greater Mara. In 2004, Joe and his wife, Gillian, established the Leleshwa Camp on the Siana Group Ranch, on the edge of the Maasai Mara. This pristine, wilderness region is an important migration corridor between the plains of the Mara and the Loita Hills and Plains, and a critical refuge for many animals, including elephants and wild dogs. "In 2008," says Joe, "we saw our first pack close to Leleshwa Camp -- eight individuals raced through, and there were more reports of sightings over a one-week period. Since then, eyewitness accounts from our scouts, community herdsmen and safari guests have shown that the dogs are using Siana as part of their range, and they seem to be becoming more and more comfortable with the area. "The establishment of real functioning conservancies," says Joe, "such as the one around Leleshwa Camp, and the local communities' evolving attitudes have played a major part in this change. It is my hope that through continued efforts, Leleshwa Camp will soon be reporting regular wild dog sightings with larger pack sizes and that the general wild dog population will continue to spread into the Mara, reclaiming its previous range." Your chances of seeing a wild dog while on safari: The wild dog is one of the world's most endangered mammals. The World Wildlife Fund estimates there are only 3,000 to 5,500 left in the wild. They are extremely successful predators, but their numbers are in steep decline due to habitat loss and persecution by humans. 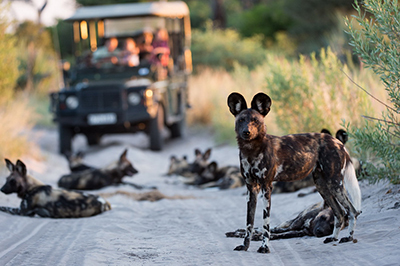 As a result, your chances of seeing a wild dog are generally poor, but you can increase your odds by visiting protected areas, such as the Serengeti or Botswana's Chobe National Park, where packs still roam free. Joe was born in 1975 in northern England. At the age of ten, he moved with his parents to Kenya, where his lifetime of adventuring in Africa began. In the process of establishing the Leleshwa Camp, Joe got to know the local Maasai community and took on an active role in setting up the Siana Conservation Area. Along with Gillian, Joe Charleson manages Natural Habitat Safaris from Kenya. He divides his guiding time between Leleshwa Camp, Nairobi and the bush. Get started on your own Big Five wildlife dream list by checking out the Adventure Collection tour companies that offer trips to Africa and African safaris.